Blizzard highlighted an ongoing PvP development they're calling Mercenary Mode today, in which players can - when queue times for unrated Battlegrounds or Ashran get too high - speak to an agent of the enemy faction in the faction base in Ashran (Stormshield or Warspear) to queue as a member of the opposite faction. This feature would allow players to play as a mercenary, earning all of the standard PvP rewards, while thrown into the fight as an automatically race-changed character. Faction-specific achievements cannot be completed this way in the current design. They say, “Keep your friends close, and your enemies closer”—and soon, you’ll be able to do just that. In an upcoming patch, we’ll be adding a feature that allows you to act as a mercenary for the opposite faction in PvP. Whenever your faction is experiencing a long wait time to get into Ashran or unrated Battlegrounds, agents of the enemy faction will appear in your base in Ashran (Stormshield for the Alliance, Warspear for the Horde). These agents will allow you to enter Ashran or Battlegrounds disguised as an enemy player, and actually fight as the opposite faction. When you compete as a mercenary, you’ll still earn all the same rewards you would have by winning or losing as your own faction (with the exception of faction-specific achievements). You’ll also have your race automatically changed into one appropriate for the opposite faction while you’re still inside the Battleground or Ashran. Perhaps most importantly, however, you’ll experience much shorter queue times, as our matchmaking system will be able to fill up groups much quicker! 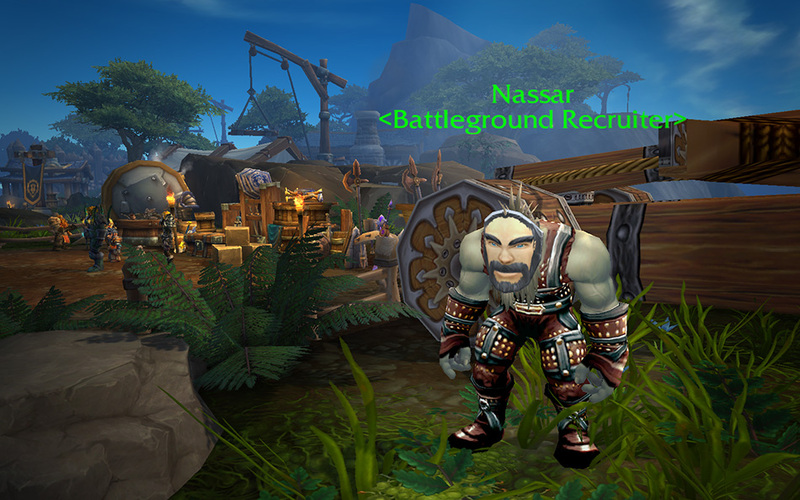 Our goal with Mercenary Mode is to allow players who want to participate in Ashran or unrated Battlegrounds the ability to do so without having to wait through long queues, while still maintaining the spirit of the core Alliance vs Horde fantasy. We’ll be testing this feature soon on the Public Test Realm, and look forward to hearing your feedback! It will be interesting to see the PvP community's responses to this, as it solves one issue - queue times - quite well, but leaves some other core PvP considerations on the table. Is this a feature you could see yourself taking advantage of? A feature is in development that would allow players to queue for unrated Battlegrounds and Ashran as an agent of the opposite faction in PvP. I only ever do Arenas and RBGs anyways, so I won't be using this feature much, if at all. One thing that worries me for the players that do plan to use this however; if you change races for the length of the game, do you still keep your actual races racial abilities? So an undead turned night elf would still keep 'Will of the Forsaken'? That's a question I would really enjoy seeing answered. Also: I can't speak Common, so it may be hard to communicate. The changes below will be going live this week. DoT specs are often in the "normal" damage range for single-target fights and can be significantly above "normal" for multi-target fights. Please note that the goal here isn’t to just counter-tune specs in each bit of new content as we believe specs that work well in an encounter should continue to do so. Regarding this specific Shadow Priest change, their multi-target performance was beyond our tuning targets and so we simply want to bring them back into range while minimizing the impact to their single-target performance. Developers’ notes: The damage reduction to this talent is meant to curb the synergy of Insanity and Shadowy Apparitions generation when combined with some Azerite traits, while still leaving it as a fun and interesting combo. Abyssal Speaker's Gauntlets ’s shield absorption effect is reduced by 66% when engaged in combat with enemy players. Trident of Deep Ocean ’s shield absorption effect is reduced by 50% when engaged in combat with enemy players.